Only €15 to add 043 landline. Your €15 includes for Ireland and UK landline calls. This option is ideal for light internet users who who want a low cost broadband package and 100+ TV & radio channels. 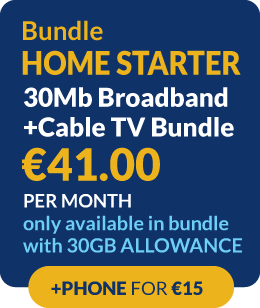 With our Home Starter broadband package you can instantly check your emails, book flight tickets get up-to-the-minute stock quotes, sports scores or simply surf the web, all for €41.00 per month!